become so well known and famous in the community and beyond. This young man of 75 years with broad shoulders and untiring zeal does not know the word ‘NO’. He is omnipresent in community gatherings whether of grief or joy and is on his own happy to accept any responsibility with smile on his face. Born on 27 Nov 1940 at Bulandshahar town of west UP had his early education at Agra. True to his name he was selected for IAF and joined the service in June 1962. He would be amongst few veterans who participated in 1962, 1965, 1971 and Kargil war of 1999. Finally, retired in Nov 2000 in the rank of a Flying Officer after distinguished service of 38 years. Soldier is working with dedication for the community since 1991 even while in service. In Feb 2014 he was elected for the coveted post of President Kulshrestha Sabha Agra thus joined the gallery of illustrious Kulshresthas who have been the past presidents. During his tenure he has accomplished major renovation at Kulshrestha Bhavan Shahganj Agra. He is the backbone of Kulshrestha Kalyan Samiti being the Coordinator of western Uttar Pradesh which is the base of its resources and disbursements for the welfare of the community. Kulshrestha Kalyan Samiti is today honoured to give the prestigious award of ‘Kulshrestha Ratna’ for the year 2015 to Flying Officer (retd) Virendra Kumar Kulshrestha for his self less and long dedicated service to the community. 1. Shri AJIT KULSHRESTHA, Addl. Director General, CRPF Delhi has been awarded by Govt. of India with the “President’s VishishthSewaPadak”. He has been awarded for his outstanding contribution in Police services. 2. Km. ANANYA KULSHRESTHA D/o Shri K K Kulshrestha, Delhi joined Indian Revenue Services (IRS) in Central Govt. of India. She has posted in Nagpur (MH). 3. Shri GAURAV KULSHRESTHA, Gwalior has been honoured in outstanding performance in Sculpture Art by the Chief Minister. He is son of Shri Narayan Swaroop Kulshrestha. 4. Shri VAIBHAV KULSHRESTHA, Agra has been selected for Young Scientist Award by UP Govt for his contribution in the field of Science. He is son of Shri Hari Mohan. 5. Shri SURENDRA PRASAD KULSHRESTHA, Jalaun (UP) has been honoured by Hon’ble Governor of UP on Teacher’s day for his contribution in the field of Education. 6. Shri KUSH KULSHRESTHA, Principal – Central Academy School, Gwalior has been honoured with Guru Shrestha Award by All India Trade Development Association, Delhi. 7. Smt. ARCHANA KULSHRESTHA, Gwalior has been honoured with Bahadur Beti under BetiBachao Campaign commenced by Gwalior Municipal Corporation. She is wife of Shri Lavlesh Kulshrestha. 8. Dr. SONAL KULSHRESTHA, Gwalior has been honoured with the highest degree of FICOG by National Conference in Mumbai. Many of her papers has been read and published in International and National conferences. She is wife of Dr. Sudhir Kulshrestha. 9. Ms. MALLIKA KULSHRESTHA, Delhi won Silver Medal in Floor exercise of 27th Sub-junior Artistic Gymnastic National Competition. She has got 8th ranking in India. She is daughter of Shri Sanjeev and Smt. Nita Kulshrestha, Delhi. 10. Ms. RITIKA KULSHRESTHA, Delhi won Bronze Medal in 54th Junior National Gymnastic Competition. She has got 7th ranking in India. She is daughter of Shri Sanjeev and Smt. Nita Kulshrestha, Delhi. 11. Ms. VRIDDHI KULSHRESTHA, Delhi won First position in Band at Zonal Level Competition and qualified for State Level Competition. She has also participated in ShrishtikeNavras and Ohm as main lead of group dance in one of the emotional Ras relevant to the social cause “BetiBachao” performed at Talkatora Stadium, New Delhi. 12. Mr. ARPIT KULSHRESTHA has been honoured with Chief Minister’s Merit Student Promotion Award and Rs. 25000 for Laptop in securing more than 85% marks in 10th standard. This has been awarded by MP Secondary Education unit. 13. Mr. JAYPREET KULSHRESTHA, Age 15 yrs, won Bronze Medal in 4X100 Mtr organized by SanatanDharam Group (Haryana & Punjab). He is son of Mr. Sanjay & Mrs. Priti Kulshrestha, Ambala Cantt. 14. Km. DRISHTI KULSHRESTHA, Agra has won third prize in Elocution event of Inter-University Youth Festival, as organized by MJP Rohilkhand University, Bareilly. She is daughter of Shri Sheel& Smt. Neelam Kulshrestha. World Kayastha conference was organized on 8-9 December, 2012 in Hyderabad. Our Senior member Shri DEVENDRA PRAKASH KULSHRESTHA, Delhi was honored by Shri SUBODH KANT SAHAI, Member of Parliament, for active participation in development and welfare of Kulshrestha community. He is well known personality and fully dedicated to the welfare of Kulshrestha and Mentor for many Social organizations / Association. Major ANKUR KULSHRESTHA S/o Shri SUSHIL KUMAR KULSHRESTHA [Etah, U.P. ], has been awarded by Central Commandant - Madhya Bharat for infallible command and team captaincy in Shooting Championship - 2012. Recently, he has also been awarded with the Commendation Card in January - 2013. Shri KULDEEP KULSHRESTHA [Morena, MP] has been awarded with Census Silver Medal by the President of India through Registrar General and Census Commissioner Dr. C. Chandramauli for outstanding zeal and high quality of service rendered during Census - 2011. Dr. SHWETA KULSHRESTHA W/o Shri HIMANSH KULSHRESTHA [Jaipur, Raj.] was invited by Omics Publication Group of Texas, USA for attending three days summit on Global Biofuels & Bio-products in November-2012 wherein she has delivered plenary speech on Bioremediation and Biodegradation. Also participated as co-chair the conference along with Prof Dr. C R Nair of Paine College [USA]. Shri RAJAT KULSHRESTHA S/o Shri SANJAY KULSHRESTHA, Morena [M.P.] has designed a web-blog www.textilequestionbank.wordpress.com, which contains question papers of last 20 yrs. for three branches of Textile in B.Tech; Engineering, Technology & Chemistry and M.Tech entrance test. Rear Admiral (R) SANATAN KULSHRESTHA has become Senior Fellow of New Westminster College, Vancouver Canada. He has also been placed as part of "Brains Trust" of Hindustan University Chennai. His website www.skulshrestha.com titled 'unbiasedjottings' has been shortlisted for Defense IQ Blogging Awards. PROF. DR. VINOD KUMAR has received VayoshresthaSamman Award (Lifetime Achievement Award in the field of Ageing) from the Ministry of Social Justice and Empowerment, Government of India. 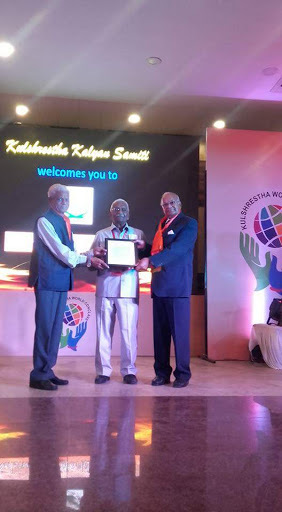 Shri V D KULSHRESTHA Lucknow awarded with 'KayasthaRatna' by Akhil Bhartiya KayasthaMahasabhaon 05th May, 2013 for his distinguished services to the community and social work for underprivileged. Dr. BHAVNA KULSHRESTHA has been honored with Indian Leadership Award for Education excellency award. This has given by Global Foundation Economics and Human resource development association. Ex. CBI Chief Shri Joginder Singh has awarded Dr. Bhavna in a function in Delhi. Ms. VRIDDHI KULSHRESTHA has been declared youngest volunteer globally of Messenger for Peace in October-2013. The announcement was made at a function in Delhi in presence of their foreign representatives. Ms. Vriddhi is studying in Class VII and daughter of Shri Vivek and Smt. Nishi Kulshrestha, Delhi. Ms. ANISHA KULSHRESTHA has been awarded with Gold Medal in UP State rifles shooting and qualified for National Competition. She is 13 yrs old and studying in Class-VII. She is daughter of Shri Alokand Smt. Hema Kulshrestha and granddaughter of Shri Virendra Kumar (Soldier), Agra. Shri ANUNAY KULSHRESTHA has got admission in Stanford University, USA for his bachelors in Computer Science and Mathematics (double major). He passed his Class XII from Delhi Public School, Dwarka, New Delhi and secured 95.6% marks. He is son of Dr. Manoj and Dr. Rashmi Kulshrestha, Delhi. Ms. AKANKSHA KULSHRESTHA has been awarded with medal for standing first in M.Pharm examination-2011 by the former President of India and an eminent scientist Dr. APJ Abdul Kalam on 10-July at the convocation of IIT, Varanasi. Let us join our hands together and wish them for bright and successful endeavor.